Excellent news to share. The good news is that we have raised 20% of the target amount to date. The bad news is that the current scanner has finally packed in and so Zithulele Hospital is without an ultrasound scanner. We therefore need to double our efforts to raise the remainder needed to purchase a new scanner. Please help us by donating and spreading the word. We have some good and bad news to share. The good news is that we have raised 20% of the target amount to date. The bad news is that the current scanner has finally packed in and so Zithulele Hospital is without an ultrasound scanner. We therefore need to double our efforts to raise the remainder needed to purchase a new scanner. Please help us by donating and spreading the word. We give antenatal care for a rapidly expanding population, and people are coming from further afield to get care at Zithulele Hospital. The number of deliveries we see are increasing every month, while our perinatal mortality rate is falling to truly remarkable levels. To maintain this pressured service we need reliable ultrasound scanning to allow dating of pregnancies and diagnosis of problems early. 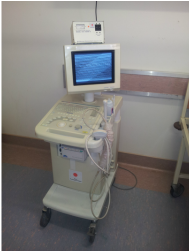 We also use ultrasound to investigate and diagnose gynaecological, medical and surgical problems such as ectopic pregnancy, abdominal tuberculosis and gall bladder disease. We scan around ten patients every day for various conditions, mostly antenatal reviews. The current scanner does a good job for general ultrasound, but is very unreliable and prone to prolonged outages especially if the power is cut. The latest power cut left us without a working ultrasound for six days, during which time we had to turn away several expectant moms who came a long and expensive way for their booked antenatal scans. The time before this the machine started working after two days just in time to help us diagnose a set of undeliverable twins - saving two babies and possibly the mom's life. We have to leave the machine on constantly to minimise the risk of it not starting, and this means the screen and electronics are getting additional wear. We have been told by our equipment maintenance company that the machine is not able to be serviced and would be un-fixable if it finally breaks. Unfortunately there is no feasible way of obtaining a new machine through the Department of Health. With the rapidly increasing obstetric burden at Zithulele we need a modern, reliable and durable ultrasound machine to help us keep moms and babies safe. Our goal is to raise money for a new Sonosite ultrasound machine. This machine has a battery, so is available to work even during power cuts, and is extremely durable. The five year unlimited warranty makes it easy to repair in the unlikely event of a problem. Offering high image resolution and doppler (blood flow) measurement we will be able to offer more detailed and helpful scans to complicated obstetric cases and medical patients with vascular disease (relatively common in our setting). The expected cost for this machine is about £15,000 (R200,000, US$23,000). Over £2,700 has already been pledged and we are hopeful of raising the remainder quickly. As Jabulani is a registered NPO, all SA donations are tax deductible (tax certificates provided). Jabulani is also a registered charity in the UK and so if you are a UK tax payer please GiftAid your donation. When making your donation, please use "ultrasound" followed by "your name" as the reference to help us make sure your donation is allocated correctly. A huge thank you from the teams at Jabulani Foundation and Zithulele Hospital.